Mastercard Inc. is winning new deals with banks and merchants even without sweetening its incentives as much as analysts expected, helping the world’s second-largest payments network post profit that topped estimates in the third quarter. 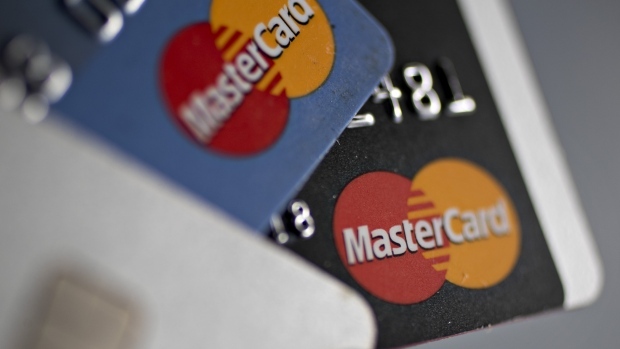 Mastercard offered its partners US$1.73 billion in rebates, an 18 per cent increase from a year earlier but still below the US$1.84 billion average estimate of analysts surveyed by Bloomberg. The network has said it was boosting incentives in its bid to ink card deals. -Rebate costs are being closely watched as competition for customers heats up among payment networks. Mastercard poached a major Bank of America Corp. card deal from larger rival Visa Inc. and added the store cards for Kroger Co. and LL Bean Inc. this year. -Spending on the firm’s network climbed 11 per cent to US$1.08 trillion, missing the US$1.11 trillion average of five analyst estimates compiled by Bloomberg. Visa also posted a smaller jump in spending than analysts expected. -While some analysts predicted the firm would change its forecast for this year’s adjusted net revenue, the company said Tuesday it still expects the figure to climb by a per centage in the “high teens.” Operating expenses are also still forecast to rise in the “mid-teens” range previously set. -Mastercard shares, which surged 26 per cent this year through Monday, jumped 1.1 per cent in early trading to US$193.15. This year’s advance outpaced the 6.1 per cent gain of the 66-company S&P 500 Information Technology Index. -“Our business wins and new partnerships, strengthened by our differentiated services offerings, are helping drive our global momentum,” Ajay Banga, Mastercard’s chief executive officer, said in a statement announcing third-quarter results. -Fees from cross-border transactions, or money spent abroad, rose 16 per cent to US$1.34 billion, just below the US$1.35 billion estimate.